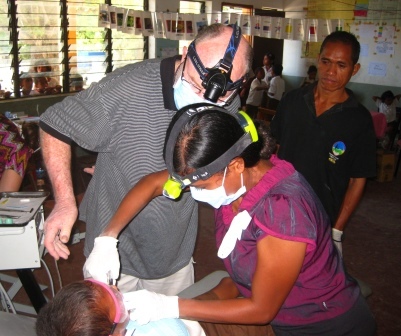 The Timor Leste Dental Program was founded in June 2003, when we were invited by the Carmelite Sisters to set up a dental clinic in their health centre in Maubara, on Timor Leste’s north coast. The rural location and the provision of a dedicated space for a dental surgery made this an ideal base for a program aimed at assisting the largely rural Timorese population who have no way of accessing services in Dili. Timor Leste Dental Program video from TLDP on Vimeo. The Timor Leste Dental Program would be unable to function without cooperation and collaboration with our Timorese partners. These include the Carmelite Sisters, the Jesuit Mission in Railaco, as well as the Maubisse Hospital dental team. These strong relationships provide our teams with much of the coordination and accommodation in many of the regions that we visit. The Timor Leste Dental Program is registered as Project 110/2004-05 within the Rotary Australia World Community Service (RAWCS). Rotary Australia provides organisational and financial structure for the program, which includes travel insurance for our volunteers and tax deductibility for our donors. The program has the approval and support of the Timor Leste Ministry of Health and we liaise directly with Clinical Directors of the hospitals and health centres in the villages and towns in which we work. The Timor Leste Dental Program is dedicated to supporting the East Timorese people’s struggle to become self-reliant. This program is based on the philosophy that the solution to local problems lies within local people. Solutions imposed from the outside are doomed to failure because local people are not brought into the decision-making process. The role of the outsider (that’s us!) is to serve – to share who we are, the skills we possess, and the talents we have been given. Hence, our work program and work locations have been determined by our original Timorese coordinator, Sister Filomena, in consultation with local people, local schools and local health authorities. Moreover, our primary purpose is not to deliver dental treatment to the Timorese people. Although relieving suffering is an important part of our work, a sustainable dental solution requires a focus on prevention and continuity. Hence, we consider that our most important task is to provide support for the local dental therapists by way of training, mentoring and provision of essential equipment and materials. Our teams visit the same regions every year, providing treatment to the people and regular mentoring to the therapists in these areas. We also employ our own Timorese dental therapist full-time, who is based in our fixed clinic in Maubara and who runs a school dental program in the surrounding district. All our volunteers self-fund their trip, but return home enriched by an increased awareness of ethnic, cultural, religious and racial diversity and the discovery that we are far more alike than we are different. Thanks to Sam Moran (one of our fabulous volunteers!) for creating the video about our program.